img. 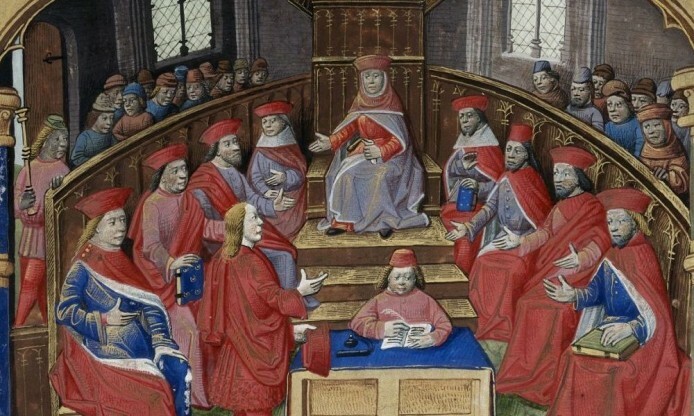 Court in session from BL Harley 2681, f. 2, British Library, Public Domain via Europeana. There is a growing awareness among cultural institutions who wish to share their collections online on the importance of providing their digital objects with accurate rights statements, so that users of cultural heritage understand how they can possibly reuse the content they discover. This helps a digital collection to be more visible and attractive for both professional users (researchers, publishers, creative industry in general) and amateurs. Europeana and the experts of Kenninsland did some research on the large database of available records in Europeana, in order to understand the status of rights labelling. Up to the launch of the Rights Labelling Campaign in 2013, 30% of objects in Europeana didn’t have a rights statement, while today 100% of objects do – but are these reliable and accurate? According to a recent research report by Kenninsland, 62% of content published via Europeana has accurate rights statements, while there are recurring issues of incorrect labelling of objects using Creative Commons licences and the Public Domain Mark. The research undertaken, which was based on extrapolation, differentiated between inaccurate statements. For example, there are cases of an object labelled with a Public Domain Mark (PDM) while the data clearly confirms it is still in copyright. There are also others questionable such as where the data published does not appear to support the selection of a Creative Commons licence. It also highlights the issue of objects that are not protected by copyright, and those where the copyright has expired being labelled with a Creative Commons licence. Such issues with CC licenses in Europeana is probably due to the fact that they have been designed to allow creators and other rightsholders to make their own works (in which they own the rights) available for reuse, while cultural heritage institutions (the most of content providers in Europeana) generally do not own the rights of the works in their collections. This means the CC licenses have not been designed with cultural heritage institutions and for this reason they find it difficult to apply such licenses to their collections. Through policy and training, Europeana wants to support the improvement of the quality of the rights statements, but cannot by itself completely solve the underlying problems concerning their accuracy. The accuracy of rights statements is in the first instance the responsibility of the institutions that make digital objects available via Europeana (the data partners). For this reason, recommendations by Kenninsland distilled from the research include the development of more effective and straightforward guidelines for content holders. To this regards, the role of experts hubs and aggregators like PHOTOCONSORTIUM is even more key to support the process of awareness raising and accuracy improvement actions on the side of content providers. It is a part of the work in DSI3 project which hopefully will continue in the next years.